Classic Motor Crafts Flaming Torch Logo Fibre Glass Bermuda Hardtop Sticker. 45mm or 70mm. Amco Gear Shift Lever Pattern Sticker. 2.5". Amco Style 4 Speed Gear Shift Lever Pattern Self Adhesive Badge. 2.5". Amco Style 5 Speed Gear Shift Lever Pattern Self Adhesive Badge. 2.5". Austin Birmingham England Flag & Scroll Sticker. 4". Austin Crest Black Background Circular Silver Stickers. 50mm or 61mm Pair. Austin Crest Black Background Circular Stickers. 50mm Pair. Austin Healey & Duckhams Oil Service Sticker. 3". Austin Healey & Shell Oil Service Sticker. 3". Austin Healey '3000' RAC Rally Banner Art. 17" x 25". Austin Healey 3000 100-6 etc Union Jack Sticker. 4". Austin Healey 3000 Oblong Style Laser Cut Magnet. 3"
Austin Healey Allery & Bernard Ltd Chelsea London Dealers Sticker. 2.75". Austin Healey Circular Window Sticker. 4". 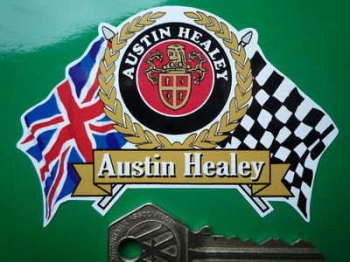 Austin Healey Crest & Chequered Flag Stickers. 4" Pair. Austin Healey Crest & Cooper Style Text Circular Stickers. 50mm Pair. Austin Healey Crest & Cooper Style Text Circular Stickers. 55mm Pair. Austin Healey Crest Circular Silver Stickers. 3" Pair. Austin Healey Crest Circular Sticker. 5" or 6.5". Austin Healey Crest Circular Stickers. 42mm or 55mm Pair. 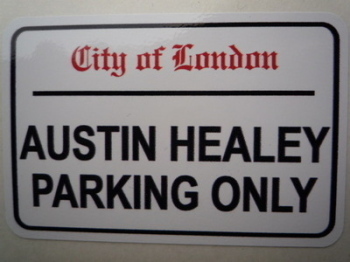 Austin Healey Crest Model Specific Circular Sticker. 4". 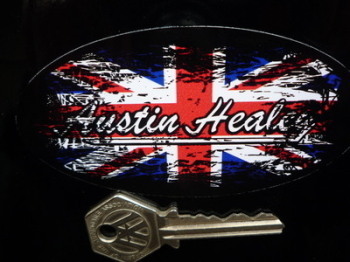 Austin Healey Fade to Black Union Jack Sticker. 4". Austin Healey Flag & Scroll Sticker. 4". Austin Healey For The Love Of Life Oblong Sticker. 6.5". Austin Healey Frogeye Sprite Oblong Style Laser Cut Magnet. 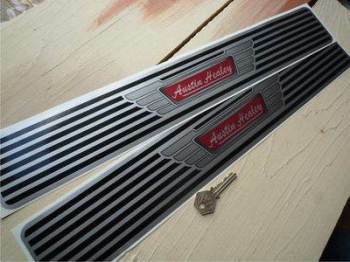 3"
Austin Healey Kickplate Sill Protector Stickers. 20" Pair. Austin Healey Logo Nationality Country ID Plate Sticker. 5". Austin Healey Logo Style Self Adhesive Laser Car Badge. 25mm. Austin Healey Parking Only. London Street Sign Style Sticker. 3", 6" or 12". 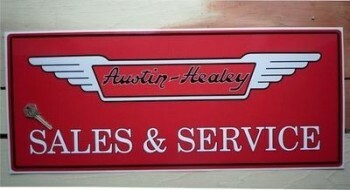 Austin Healey Sales & Service Sticker. 23.5". 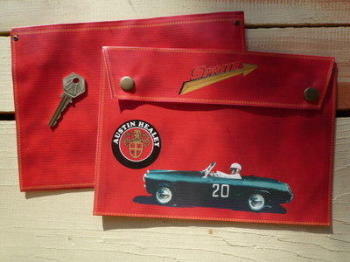 Austin Healey Script Style Self Adhesive Car Badges. 5.5" Pair. Austin Healey Sprite Crest Circular Silver Stickers. 2.25" Pair. 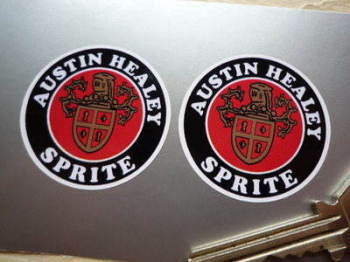 Austin Healey Sprite Crest Circular Stickers. 40mm or 42mm Pair.